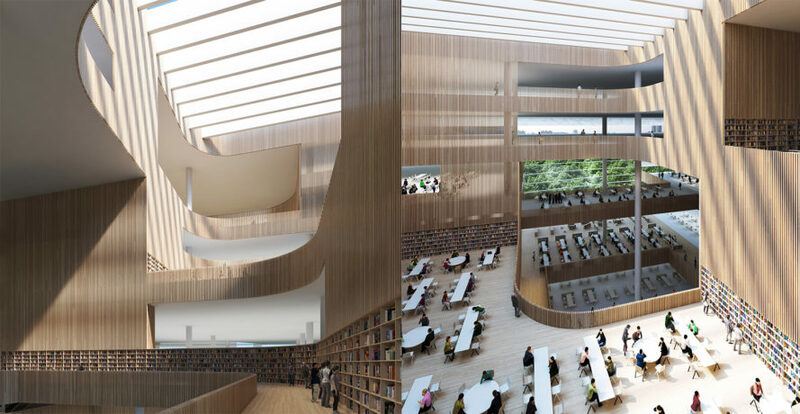 Schmidt Hammer Lassen Architects just unveiled plans for the new Shanghai Library that are every bit as impressive as the city’s many futuristic buildings. Set to rise in Pudong overlooking the immense Century Park, the Shanghai Library will be light-filled with an eye-catching form. The design beat out proposals from competing firms including Kengo Kuma, David Chipperfield, and Dominique Perrault. Natural light fills the interior through the fritted glass bands that wrap around the building and a large skylight above the central atrium. Three staggered reading rooms are arranged around the atrium and feature low walls and open seating to promote transparency and spaciousness. Curved timber walls, bookshelves, and floors give the modern interior a sense of warmth. The Shanghai Library is expected to open in 2020. Schmidt Hammer Lassen Architects has won a design bid for the new Shanghai Library that’s every bit as impressive as the city’s many futuristic buildings. Set to rise in Pudong overlooking the immense Century Park, the Shanghai Library will be light-filled with a top-heavy and eye-catching form. The design beat out proposals from competing firms including Kengo Kuma, David Chipperfield, and Dominique Perrault. The 125,000-square-meter Shanghai Library is shaped like an inverted triangle that appears to float over the landscape. The main library, clad in alternating strips of glazing and floor plate, is set above two glass pavilions housing a 1,200-seat performance venue, exhibition and events space, and dedicated children’s library. 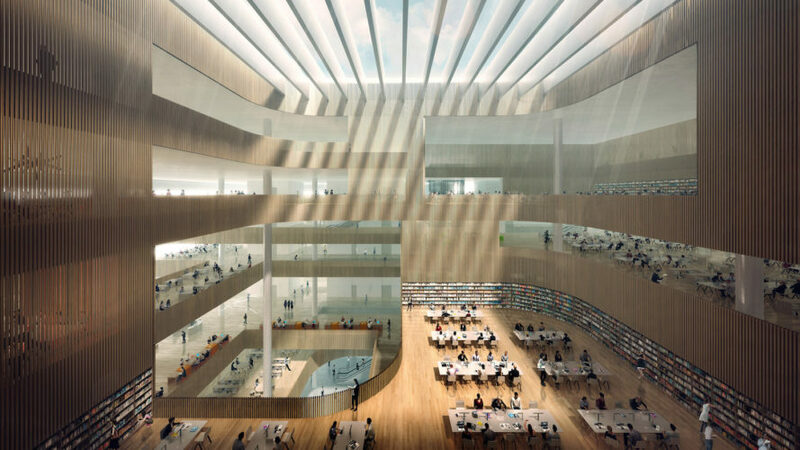 "We see the library as the focal point in a park, a central rock within a city-scale Chinese garden," said Schmidt Hammer Lassen partner Chris Hardie. "One of the most compelling things about this project is its location within a parkland setting. You are in the heart of the world's largest city, yet we have the opportunity to create a sanctuary for knowledge and media in the trees." Natural light fills the interior through the fritted glass bands that wrap around the building and a large skylight above the central atrium. Three staggered reading rooms are arranged around the atrium and feature low walls and open seating to promote transparency and spaciousness. Curved timber walls, bookshelves, and floors give the modern interior a sense of warmth. The Shanghai Library is expected to open in 2020.